During war, keeping troop movements, and movement of naval forces a secret, is very important. There was a slogan used during WWII that helped remind people not to pass information too freely, the slogan was "Loose Lips Sink Ships". 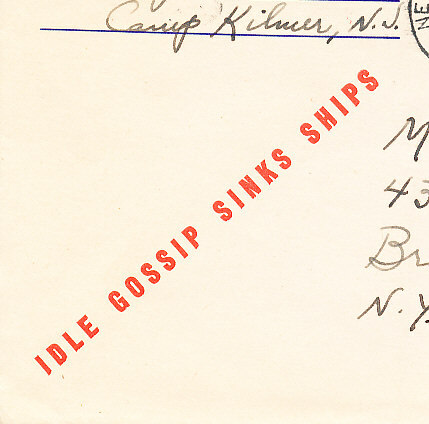 The photo blelow shows an envelope with “Idle Gossip Sinks Ships” printed on it. 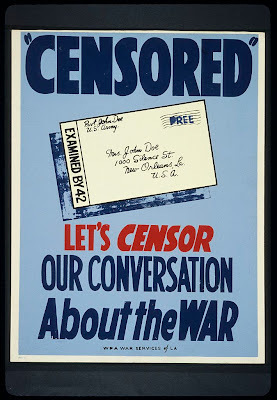 Because it was so important not to let out information that might reach enemy forces, letters were censored. Since letters were routinely censored, most letters contain no real specifics as far as location (except for the country), where the writer is going next, battle content, or movement of other units. All letters were censored after training, whether the writer was a Marine, Army soldier, Navy sailor, or a member of the Coast Guard. 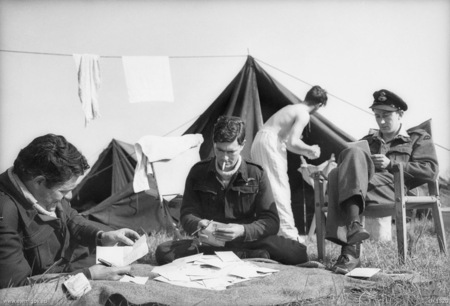 As a result, some of the more interesting letters were written after the war ended, or after hostilities ceased in an area. When a letter had been censored, the person that censored the letter, would usually, put a censor's stamp (usually on the lower left corner), and sign (usually, but not always), or initial near or on the stamp. 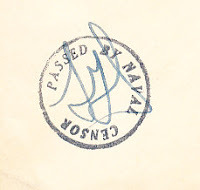 In the case of some officers, the name of the person who signed the censors stamp, was the same as the person who wrote the letter, meaning I assume, that they were allowed to censor their own letters. 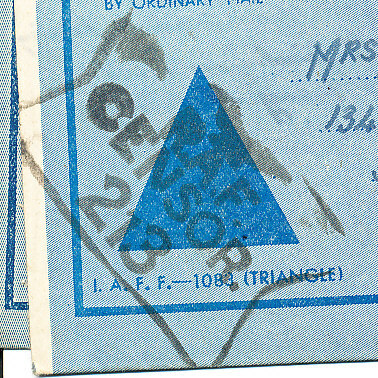 Some letters were opened after they had been sealed, and those letters were usually taped back shut, with a tape that said 'opened by censor', or just 'opened by'. 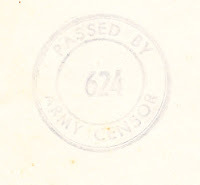 Most in the military knew what they could, and could not say, so they stayed within those restrictions, but occasionally they would write something that the censor didn’t like, and in those cases, the censor would take scissors and cut out that part of the letter, leaving a big hole. Sometimes they would allow specific information to be written about, if it had been more that a month or two since the battle or action had happened, probably because by that time it had been in all the newspapers anyway. I have noticed that there was a tendency for officers to push the limit on content more than the lower ranked members of the military. Also, the censors seemed to be a little less strict when the letter was written from a member of the military to an officer. 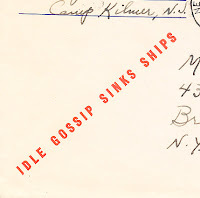 I ran across a couple of letters that were written by a sailor while he was on shore leave, where he told the recipient not to tell anyone what was in the letter, or he could end up in a Navy prison. Of the hundreds of letters I have read, I would say that if I had to put a percentage on it, about 95% are a little on the boring side, as far as containing historical content. They all still have value though, because they contain the thoughts and feelings of people, who in many cases were going through life and death struggles on a daily basis. I still feel a certain amount of reverence when I pick one up, because of what they did when the world needed them. 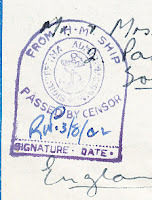 Here are a few examples of censor stamps. 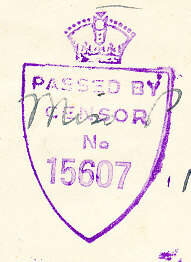 This example was used by the Royal Navy. This sailor was serving on the H.M.S. Dido. 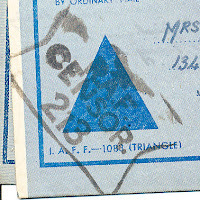 The letter that had this stamp was written by a guy in the British National Fire Service, serving in Belgium. Below are a few examples of U.S. Censor Stamps. 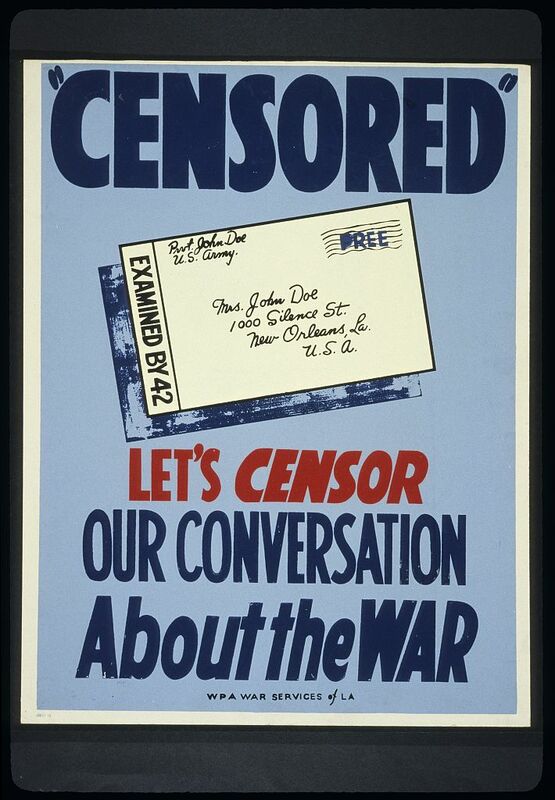 This Library of Congress Poster from WWII discourages careless conversation. Was created by WPA War Services, La. 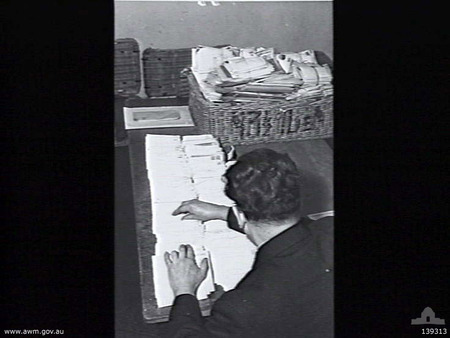 This photo from the Australian War Memorial Website, shows an Australian Censor sorting letters to be censored, 1943. 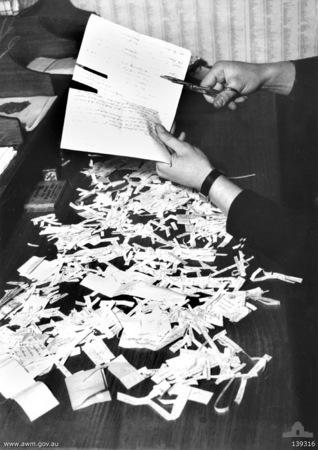 This photo from the Australian War Memorial Website, shows what happens to any portion of a letter that is deemed unacceptable, 1943. 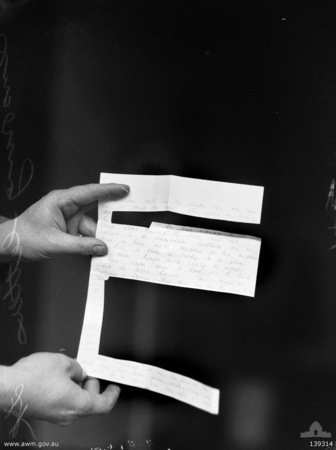 This photo from the Australian War Memorial Website, shows an extreme example of a letter containing too much information that was found to be unacceptable, by the censor, 1943. This photo from the Australian War Memorial Website, shows members of Spitfire No. 453 Squadron RAAF (Royal Australian Air Force), censoring letters before the letters can leave the air field. The photo was taken in Sussex, England, May 5, 1944. 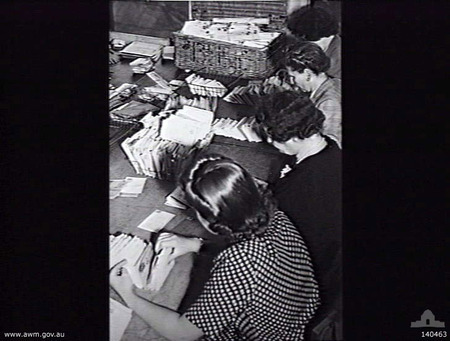 This photo from the Australian War Memorial Website, shows women working in the general post office censoring mail, Melbourne, 1944. Video with information on censorship. Envelopes from my Don Murray's correspondence (Pacific) show the censor stamp and up to two signatures of the officials (with rank) who censored them. I find it interesting that they imposed this level of accountability on the part of the censors. Don was also a censor for a time while in the Pacific (he was also a counter intelligence agent). As he was multi-lingual, was his job to censor the letters written home in Spanish, French, or Italian. He mentions this work in his letters in the book, Soft Snap. My mother worked in San Francisco censoring the mail. Among her things I found after she passed away were 2 pairs of odd scissors. these scissors cut a strip about a 1/4" wide out of a piece of paper. I've always wondered if that is what these scissors were used for. I've never seen another pair like them, anyone know about these scissors ? Maybe they are for sewing or some other purpose ? Scissors with a strip are used in stained glass work to cut patterns so the discarded part accounts for the space needed by lead or copper foil. 1/4 inch is bigger than I've seen for glass work, but they may have been specially adapted for censoring. Thanks Jim for sharing your info and envelopes. I am working on a book with my 92 year old dad/ with subtitle Letters from a WW 2 Combat Infantry Man. We have over sixty letters he wrote from France and Germany. 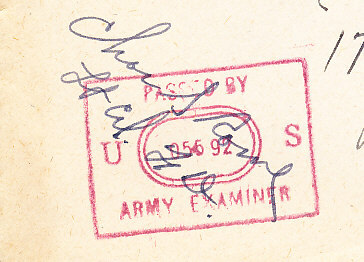 We were just looking at the Army Examiner stamps and identified the signatures of four Lt platoon leaders from his company. Very interesting because I thought the censors were all in one room reading letters. This means the censorship process was quick probably done in a foxhole right after the soldier wrote it. 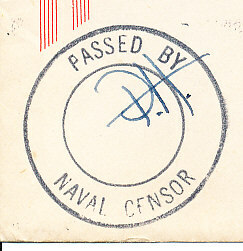 I have seen an envelope that was held by the British censors in Bermuda until after the war was over. It has a cachet "condemed". Why would they use such a marking? Thant's a new one for me, Ken. It would be interesting to know that one. Sorry I couldn't help.